I am hooked on Jennifer Ashley’s “Shifters Unbound” series. Set in Austin, Texas – an old stomping ground of mine – the series is set in the Austin Shiftertown. After the outing of shifters, they are rounded up (no matter if they are living in the outback of Alaska – the humans turn them in… cretins!) and shoved into broken-down slums to live all together, wolves, cats, bears . . . wow. Humans are really dumb. This edition of the series focuses on one of my favorite characters, Rebecca. A Kodiak bear, Rebecca is captured and removed from her home in the woods of Alaska (really, people? All the isolated acreage in Alaska, and you have to drag her all the way to Texas and stuff her in a house with four other bears?!) Used to being mostly alone and able to wander and roam at will, being stuffed into a house with so many others is uncomfortable, to say the least. And the shock collars shifters are forced to wear, to keep them from “Attacking Humans! Shriek! !” are not only uncomfortable and demeaning, the darn things HURT if you have to defend yourself from humans with guns . . . I have watched Rebecca through the other books in the series, and was glad to get to the book that focuses on her. After getting in trouble for going for a run in the wrong place (Stupid humans. Building their pharma company so near Shiftertown. Just what are they up to, anyway?? I don’t trust them!) 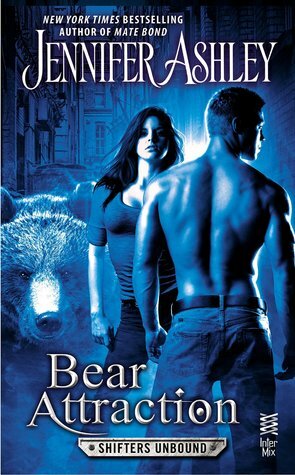 Rebecca is forced into the care of Walker, a human male who is the muscle behind the Shifter policing agency, until a missing shifter groupie is found. This book was a surprise given what Rebecca and Walker find during their search – a good surprise. I hope to learn more about that in future books – that Ms. Ashley doesn’t let that drop. This is definitely “summertime and the reading is easy” reading, but I always enjoy Ms. Ashley’s work.